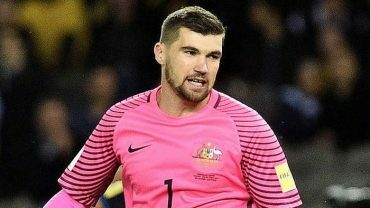 On Friday, Premier League newcomers Brighton & Hove Albion confirmed that they had broken their own transfer record by bringing in Australian international goalkeeper Mathew Ryan from Valencia. The high profile signing to Europe’s most prestigious league is the latest chapter in an up-and-down career for Ryan, widely regarded as the best goalkeeper in Asia. Martin Lowe looks at his career to date and evaluates his capabilities to become a success on the English South coast. When the news broke on Friday evening that Mathew (Mat/Maty) Ryan signed for Brighton for a club record transfer fee, believed to be in the religion of £6 million, many seasoned Premier League fans would have likely not heard too much of him and his capabilities to step it up at this level. It’s been a general theme of Ryan’s career to date that he’s bubbled under the radar of consciousness, but with this transfer he looks set to explode on the greatest platform of them all. At only 25, Ryan has plenty of time to mature, however it could be argued that he’s had the perfect preparation on his way to becoming a top class goalkeeper. He’s already won domestic and international silverware, he’s excelled in European competition, he’s played at three different European clubs already, but probably most crucially he’s had his setbacks which has seen him come through and look better for it. Ryan started his career in his home state of New South Wales, with Blacktown City before turning professional with A-League side Central Coast Mariners as a teenager. In his first full season as an 18-year-old, he was merely seen as cover, but ended up being a regular behind a back four that collected 13 clean sheets in his debut season along the way to a Grand Final appearance. Over the next three years as he broke into his 20’s, when other fledgling keepers were just finding their feet, Ryan was a mainstay in Central Coast’s most successful period as an A-League club, finishing in the top 2 for three successive seasons, clinching the A-League title in his last appearance for the club. His formative years were bedded in, and so he set sail for Europe with Club Brugge in Belgium. In two years with the club, the majority under legendary Belgian keeper Michel Preud’homme, Ryan’s stock continued to rise, highlighted by an array of standout performances in Brugge’s run to the 2014/15 Europa League quarter finals. Ryan was picking up admirers across the continent, with Liverpool being one of the many names monitoring his progress, but in the end he settled with Spanish giants Valencia, signing for £7m back in 2015. For all his success to this point, this marked the start of the toughest but probably most valuable stages of Ryan’s career, as he struggled to find favour in a Valencia side that were in a complete mess. Within four months, Ryan struggled for fitness at the wrong time, with the sacking of Nuno Espírito Santo, the manager who had purchased him, Ryan subsequently fell down the pecking order, headed by Brazilian international keeper Diego Alves. The next year was unashamedly brutal for Ryan, only making seven league starts for Valencia while a host of managers (including the ill-fated spell of Gary Neville) came and went. Come January, a loan move back to Belgium to Genk was the exact tonic that was needed to spark his club career back to life. Again Ryan starred in the Europa League, proving instrumental in another run to the quarter-finals, alongside clinching 10 clean sheets from 17 starts domestically. His ability unquestionably hadn’t shown any wavering as he ended the last season on a near high, losing in the Europa League final playoff at the end of May. While his club career has stalled, his national team profile has continued to be at a high level, featuring as our 2nd best Asian player of 2015, followed by 21st in 2016, despite his lack of domestic minutes. 2015 was his best performing year with Club Brugge, and that form transitioned to national team duty, winning the Asian Cup and Goalkeeper of the Tournament accolades at the start of the year, before being named the PFA Player and Young Player (the Harry Kewell Medal) of the Year by the end, the first time both awards were won by one single player. Ever since another Premier League Aussie keeper Mark Schwarzer hung up his gloves in 2013, Ryan has been a near ever-present in Ange Postecoglou’s national team picture, becoming essential to the way Australia play their attacking football let alone his defensive importance. Ryan is often called upon to start play-off, either acting as a sweeper to avoid delay in transitions or for his quick release (his side foot goal kicks are starting to become his trademark) to set in motion Australia’s counter attacking plays. Maty Ryan’s all round game as a goalkeeper is up there with the very best in the world, something that speaking from an Asian football standpoint I hope can only start to be appreciated fully now that he’s set to play regularly at the top level. His shot stopping is impressive, if at times a tad theatric, while his speed off his line and general stature is an intimidating prospect in one-on-one duels. He’s not afraid to direct play from the back, as alluded to before, he’s adept technically to initiate attacks or to avert danger, while he’s regularly in conversation with his defence. The downsides to his game have improved considerably over the years. His confidence has a lot to play with that, Ryan can sometimes come across as cocky on the pitch, a Neuer type persona, a player whose style he seeks to replicate. There has been times where I’ve winced as he misjudges a long ball over the top, or comes racing off his line too eagerly, but generally he gets his positioning right, and has definitely reduced his sense of eagerness to fly off his line in the last year of national team play. In Maty Ryan, Brighton have bought a highly talented keeper whose stalled period with Valencia over the last two years makes him an underestimated product. A keeper who has all the attributes to make a sustained impact in England; shot stopping, technique in distribution and communication skills, the £6m figure being muted is a snip if he greets his true potential. At 25 years of age, and a lengthy five-year contract ahead of him, Seagulls’ fans should be ready to welcome in a soon to be terrace favourite.